How is your project doing? Did you encounter any problems so far? Place 3 markers around your needle, through your work, after the 23rd, 46th, 69th and your first marker -(which you placed at the start of your project to mark the beginning of the round) marks the last stitch. So all in all you will have 4 markers in your work. *Repeat through the entire row, for all markers. Repeat row 1 and 2 five more times. As usual, please feel free to post your questions and comments below. You are also welcome to join in the group discussion that is taking place in the Ravelry group. Wow, it is really coming along! My daughter would love the color you picked, its her favorite. This kind of makes me want to do a crochet along! Very exciting to see the progress as it grows. Thanks for sharing, Natalie! Thanks for visiting, I am glad you like it so far. It would be a good way to get into knitting if you don't knit already ;) and you still have time to join in the fun if you would like to? Hi Natalie, Happy New Year. Lovely color you are using. 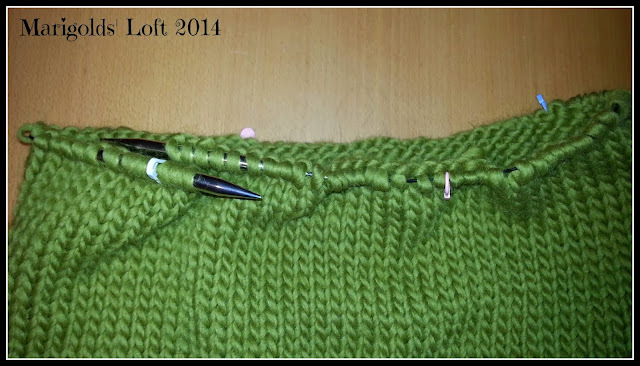 I've just signed up for a mystery kal over at Ysolda, it's all very exciting.